This Psalm is a prayer composed by David begging for the Almighty's assistance from the pursuing enemy. The Radak explains that this chapter resembles the preceding Psalms, as it refers to Shaul and David's other adversaries who relentlessly sought to take his life. 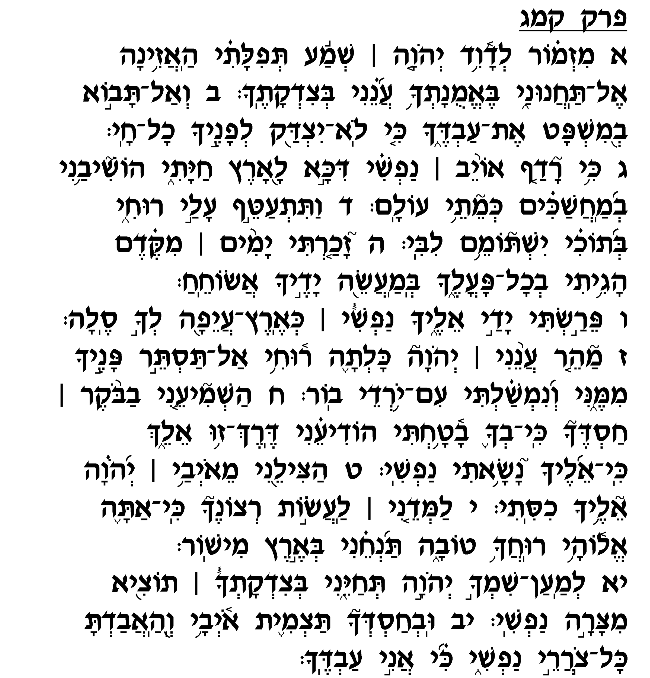 Rashi, by contrast, maintains that David composed this prayer prophetically on behalf of the entire Jewish people during the Babylonian exile. Support for this view may perhaps be drawn from verse 3, in which David speaks of the damage already inflicted by the enemy, which would accommodate the reading that he refers here to the nation suffering in exile. In verse 5, David makes reference to the miracles of yesteryear, the occasions in the distant past when God intervened supernaturally to rescue Am Yisrael from its enemies. During this time of distress, David reflects upon earlier situations of crisis when the Almighty provided redemption even when all hope seemed loss. David seeks to draw encouragement and inspiration from these memories and reassure himself of God's willingness and capability to save him even from the current crisis. David concludes his plea by exclaiming, "for I am Your servant!" ("Ki Ani Avdecha" – verse 12). Mesudat David explains, "It is the master's responsibility to wage his servant's battles against those who rise against him." David understood that he can earn the Almighty's protection only if he can truly avow his status as God's faithful servant, a status that requires God to come to his assistance, as it were. If a person serves God loyally and devotedly, then God will rush to his side just as a master naturally wishes to protect his servant. For this reason, David adds in this prayer a request that God should guide him along the proper and help him fulfill the divine will (verse 10). In order to be assured God's supernatural protection, one must assure to always do His will like a wholeheartedly committed servant, whom the master is prepared to go to great lengths to guard and protect.